AWED - Brazil Event Announcement!!! Veggie Aval Upma and the Winner!!! Simple Paneer Peas Pulao and Awards!!! I had soaked 2 cups of Channa for making Channa Masala, but didnt feel like making them stored in fridge, wanted to try something different. Just thought of this pulao. It was different my hubby and friends liked a lot. In a pressure cooker, add oil and ghee fry half the onions till brown and transfer it to a plate. In the same pressure cooker, add spices and saute for a minute. Add onions, ginger garlic and fry till transperant. Add tomatoes and curry leaves saute till they are soft. Add Channa Masala powder, turmeric and red chilli powder. Saute till the raw smell goes. Now add Channa/Chickpea and saute for few mins. Then add rice and saute once. Add enough water and salt. Close the lid and pressure cook for 2-3 whistles. Channa Pulao is ready. Garnish with the fried onions. Enjoy it as it is with papads or raitha. Channa Pulao is going off to CWF-Chickpea by Nithu and Kiran along with Channa Masala. I have tired this so far two times but big flop,will bookmark yours and try next time :) sounds yumm! yummy and interesting pulav saras! Channa pulav looks very inviting and delicious! nice to know more about you sara from Nithu's blog..I am from Bangalore too. 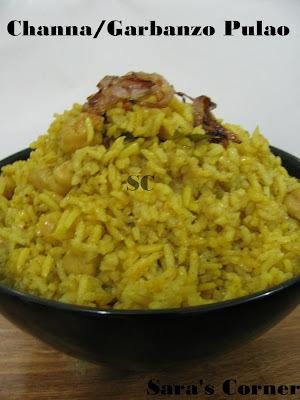 amzing pulao..havent tried with chick peas..
Nice to connect with you on FB! Thanks Nikhila for trying and sharing your events. Appreciate it.